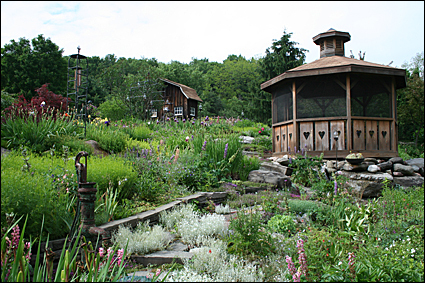 Gardening is a popular activity in the Finger Lakes, despite the fact that the growing and viewing seasons are shorter than many would like. The gardens listed here are gardens open to the public (at least part of the year) and not necessarily "public gardens". Sixty-five acre farm overlooking Cayuga Lake. Daily tours of the 15-room farmhouse. Visitor's center and shop. 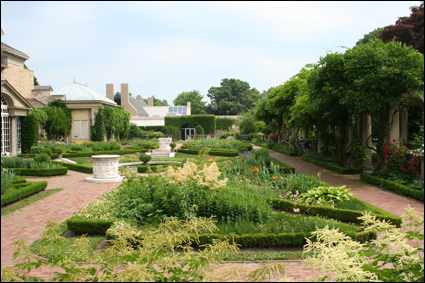 Private tree peony garden of the late William H. Gratwick III open to the public on weekends in May and early June. More than 70 species of trees, shrubs, and wildflowers on 20 acres on the South Campus. Slavin's Arboretum in Durand-Eastman Park offers a wide variety of mature trees. Of special note is Pine Valley, a world class pinetum of many rare and unusual conifers, and Rhododendron Valley, planted with members of the Ericaceae family. Trails. Owned by the Landmark Society, this half-acre garden once belonged to noted nurseryman and horticulturist George Ellwanger of Mt. Hope Nurseries. 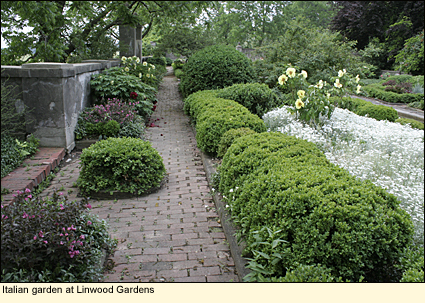 The Victorian-style garden is an oasis of perennials, trees, and shrubs. Extensive collection of peonies. A historic village with 57 19th-century buildings and 11 historic gardens. Vegetables, fruit orchards, herbs, and heirloom perennials. Events and tours. Admission charge. On the National Register of Historic Places and designated a National Historic Landmark, the George Eastman Museum is maintained as an international museum of photography and film. Its 12.5-acres of grounds include a terrace, a rock garden, a sunken garden, and more than 300 varieties of historic perennials, bulbs, ground covers, trees, and shrubs. Listed by the National Geographic Society as one of the best public gardens in the U.S. and Canada. Special events and tours. Admission charge for the museum. Designed by Frederick Law Olmsted, Highland Park is an arboretum with thousands of trees and shrubs, including the 1,200 lilacs that are featured during the Lilac Festival held in May each year. The park also includes the Lamberton Conservatory, the Warner Castle and its sunken garden, a shade border, a rock garden, a courtyard garden, a fern bed, a 13th-century herb garden, and classic and miniature roses. 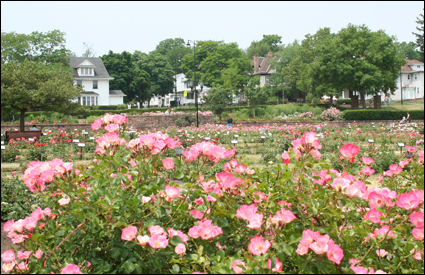 Technically a city park, Maplewood has over 3,000 plants of 300 varieties of both modern and classic roses in grouped beds on a 1-acre site. Peak bloom is the second week in June during which time there is a 3-day festival. Fountain with cascading water, benches, picnic area. Set on a 22-acre campus, the hospital, which opened in 1933, is a multi-winged, ornate brick building designed by Rochester architect Siegmund Firestone. 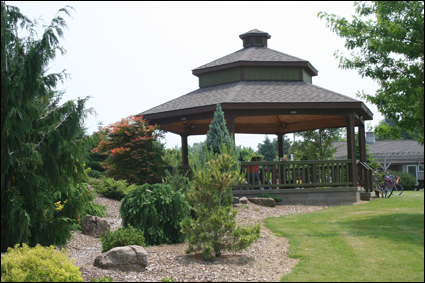 The gardens are relatively new and were established by the Rochester chapter of the Alzheimer's Association with the help of the Rochester Garden Club. 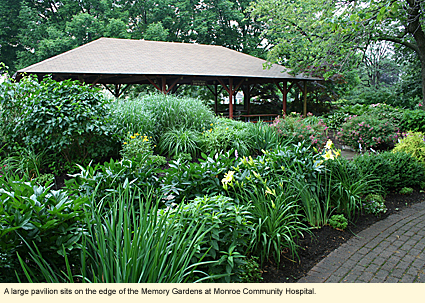 The specific purpose of the gardens is to provide Alzheimer's patients at the hospital with a place of enjoyment that might spark pleasant memories of gardens experienced in the past. Hospital employees, visitors, and other patients, as well as the public, are free to experience the solace provided by these gardens. To get to the gardens, enter the hospital campus through the main entrance on Henrietta Road. Follow the building around to the left as far as you can go. You will end at the entrance to the gardens. The gardens, in turn, continue to follow the building around toward the front, moving in and out from wing to wing. 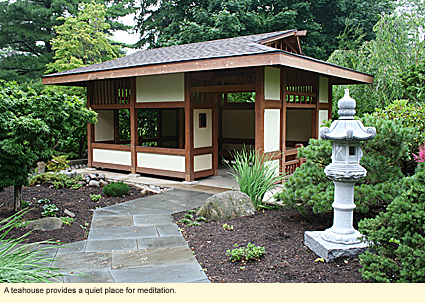 In addition to the plantings, there is a large pavilion for picnicking, a teahouse for quiet contemplation, and seats and benches in a variety of locations. The garden is open during daylight hours every day of the week, including holidays. Late June and early July are its peak blooming times. The museum maintains 12 acres near the center of the city with stately trees, native wildflowers, a formal herb garden, and colorful annuals. Admission charge to the museum. 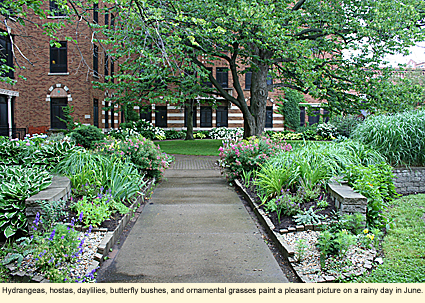 Located along the Genesee River, this campus-wide arboretum was designed by Frederick Law Olmsted, Jr. It contains many old and large trees accented by native perennials and other plants. 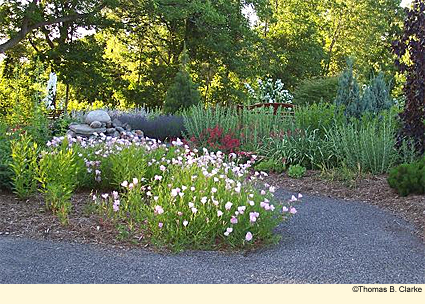 This 32.5-acre arboretum is a treasure trove of cultivated and natural landscapes, including a pond, woodland trails, a modern rose garden, an antique rose garden, an herb garden, a butterfly garden, a children's garden, as well as perennial theme gardens. More than 50 varieties of trees and shrubs. Named for the founder of Syracuse China and Pass & Seymour, which, at the time, manufactured porcelain insulators, this lovely 13.8-acre park was donated to the City of Syracuse by Pass's wife Adelaide after his death. A quiet place to stroll and watch the birds, the arboretum has many specimens that are now nearly 100 years old. The best time to visit is probably in late spring/early summer when many of the trees are in bloom. One of the must-see trees is a member of the legume family--a massive yellowwood (Cladrastis kentukea) whose white flowers hang in cascading panicles. The arboretum is within easy walking distance of Burnet Park. Pass Arboretum has only on-street parking, but Burnet Park has off-street parking. Located in Thornden Park and set high on a hill overlooking Syracuse University, the garden is comprised of 3,850 plants and more than 360 varieties of roses. Maintained by the 200-member Syracuse Rose Society, America's oldest organization dedicated to the cultivation of roses. Now a state historic park, Sonnenberg was the Victorian summer home of Frederick Ferris Thompson and his wife Mark Clark Thompson. Its 40-room mansion was built in 1887. The grounds contain a conservatory, a Japanese tea house, a par terre, and many other garden features, as well as 4,000 roses, nine theme gardens, and many stately trees. Listed by the National Geographic Society as on of the best public gardens in the U.S. and Canada. Events and tours. Next to the Finger Lakes Wine Center. Nursery, conservatory, and water gardens. Listed by the National Geographic Society as one of the best public gardens in the U.S. and Canada, the Cornell Plantations includes the 14 collections in the botanical gardens, the F.R. Newman Arboretum, and the more than 4,000 acres of natural areas (fens, bogs, gorges, glens, meadows, and woodlands) belonging to Cornell University. Make sure you visit their Web site. Brochures outside and in the Nevin Welcome Center. Gift shop, events, and tours. A 3-acre site across from the inlet to Cayuga Lake whose main feature is a wetland habitat garden with a huge Turtle Earth sculpture. 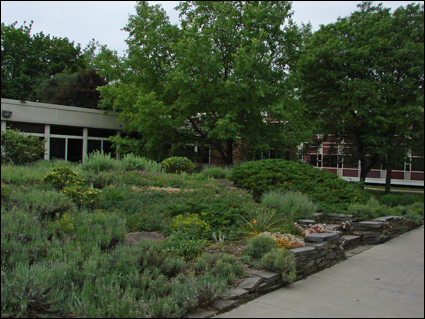 Originally a mound of dirt left over after a construction project, the Lavender Garden is located in the courtyard of the school district building just off the parking lot. 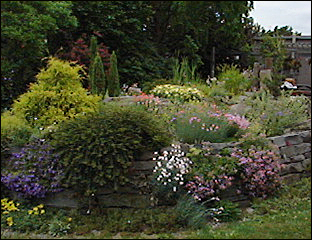 The mound was converted by a talented local resident and now has stone paths past many plants, including roses, lavender, and some rock garden plants, that love a warm, sunny location. The end of June-early July is its peak period. Designed by landscape architect Marc Peter Keane, this is a small but artistic garden in stones and moss based on the Chinese legend of the "Three Laughers," a parable that shows how overcoming differences can lead to mutual understanding. The museum owns a Japanese scroll by Kano Doun Masanobu titled the Three Laughers of the Tiger Glen. Access to the garden is either through the museum (admission is free) or from the stairway on the University Avenue side of the building. The work of just one man, this is truly an amazing place. Here you'll find an mill, a covered bridge, a gazebo, a delightful potting shed, an enormous stone sundial and numerous gardens. In addition, on display is a rare fossil of an ancient sea creature that was found on the property. This is a private garden on six acres of land with about 550 plant varieties that is open to the public by chance or by appointment. The garden is good throughout the season but is best from mid- to late May and again in late June and early July. Please sign the guest book while there. 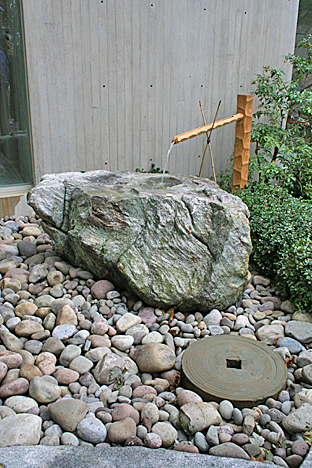 Maintained by the Adirondack Chapter of the North American Rock Garden Society in memory of a former member of the chapter, the rock garden logically incorporates a water feature among a wide variety of alpines and rock garden plants.